I think that the Wall Street Journal has finally noticed the crisis affecting local government for the next couple of years. In the article titled, California’s Dilemma, they point out the problem with the northern California city of Vallejo going into bankruptcy court to break labor union contracts. When you combine the price of real estate drops with foreclosures, the real estate tax income drops dramatically. Every person I know who owns real estate is trying to get their property re-appraised so that they can pay lower taxes and they are probably going to win. State and local governments are getting ready to go to war over budgets cuts. The greatest pain will be felt in the states who had the largest real estate appreciation, California, Arizona, Nevada, and Florida. 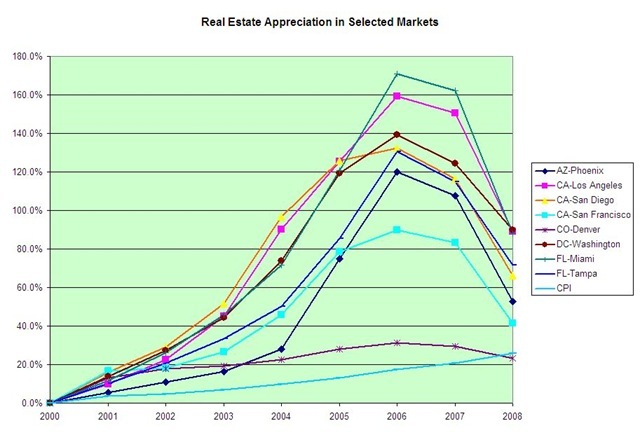 Here is a graph I did back in August when I was pondering where is the bottom of the real estate market.